This patient has passed away but did achieve a 20 year remission after being treated by Dr Burzynski. We all miss Neal very much. I am pleased to report that I have been leading a full, healthy life thirteen years after completing my treatment at the Burzynski Clinic. I have resumed and advanced in my professional career. Thankfully, the only medication I have taken over these years has been the occasional Advil or decongestant. I still believe in the importance of a healthy diet, high in fruits and vegetables, and proper dietary supplements. 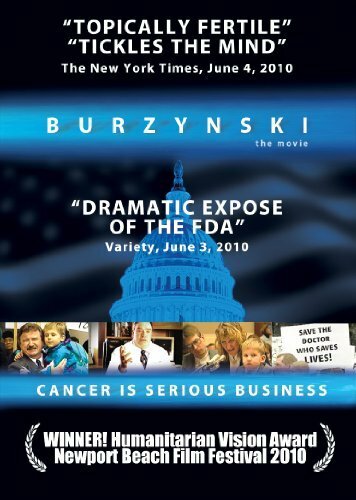 My appreciation and gratitude for Dr. Burzynski has only grown deeper over the years. His groundbreaking work and care was indispensable for me in getting a second shot at life during my dark years of 1988-1991. I am glad that he stood his ground and has expanded his work. I have often considered him to be a rare combination of Einstein brilliance and Mother Teresa's compassion. I hope to see him awarded the Nobel Prize in medicine which he richly deserves. May you all know good health. Taken from Alternative Medicine by Burton Goldberg; with permission. Perhaps the best illustration of what needs to be done when a person is diagnosed with cancer comes from the experience of Neal Dublinsky. In November 1987, Neal, then 24 years old and recently embarked on a career as a corporate attorney in Los Angeles, was diagnosed with the most advanced stage of non-Hodgkin's lymphoma, Stage IV. The bulky tumor had spread to his entire abdomen and there was fluid build-up in his lungs. "I was shocked when I got the diagnosis, and was in extreme physical pain," Neal recalls. "My doctor told me that I had to undergo chemotherapy if I wanted to live. I didn’t know better, so I did it." Neal received chemotherapy for 4 months. The treatments reduced the tumor but the reduction was short-lived. The treatments also caused traumatizing side effects, including total hair loss, a feeling of being poisoned, and high level of gastrointestinal distress. "During this time, I was taking an aggressive combination of six different drugs, and every 3 weeks I received more chemotherapy," Neal says. "Afterwards, I was completely incapacitated, and each time I returned for another treatment, it got worse." After the 4th month, Neal underwent radiation therapy for 3 more weeks. "The radiation only took a minute," Neal notes. "But within an hour I would be violently ill and retching from my core, and I could no longer eat solid foods." After the daily radiation treatments ended, Neal then underwent a bone marrow transplant using his own bone marrow. "That was the worst time of my life," Neal continues, "but once it was over, it looked like I would be all right." Only 4 months later, a new tumor emerged in his pelvic area that was beginning to compress his right kidney. At this point, all Neal’s doctors could offer was the prospect of another series of even harsher chemotherapy to buy him a little more time, but with no hope of a cure. Neal had lost faith in what conventional medicine could do for him by this point. "The physician who performed my bone marrow transplant knew everything about transplants, but almost nothing about other treatment options," he says. "It was that way with each of my doctors. Even though they meant well and were experts in their fields, none of them were able to put it all together and see the big picture." Instead of giving up, Neal contacted alternative cancer associations, including the International Association of Cancer Victors and the Cancer Control Society. He also bought books and read voraciously, educating himself about every alternative therapy he could find. In addition, he phoned over twenty cancer survivors to learn about their experiences with the therapies he was discovering. Neal was particularly intrigued by the antineoplaston therapy developed by conventionally trained physician Stanislaw Burzynski, MD, PhD, of Houston, Texas. "I spoke with ten of Dr. Burzynski’s former patients," he relates. "They had all responded well to his therapy and had suffered from similar kinds of cancer as my own. They spoke of Dr. Burzynski in glowing terms and encouraged me to see him. I decided to follow their advice, but ultimately my decision to go was a leap of faith, because my doctors’ attitudes about alternative therapies were dismissive. I figured if I were going to die, I was going to die fighting." In December 1988, Neal began treatment. The first thing he noticed was that it was not painful. Dr. Burzynski put him on an IV drip of antineoplastons that ran 10 hours a day. For 10 months, Neal remained on the drip as an outpatient. "Within weeks of beginning the treatment, my biochemical profile improved," he reports. His liver and kidney function progressed, and he started to feel better. His tumor was gradually regressing, showing slow and steady improvement. After the 10 months, Neal received four injections of antineoplastons a day, together with oral capsules. Six months later, he achieved complete remission. He stayed with the treatment for another 18 months, taking the capsules for maintenance, then he was taken off the medicine altogether. During this time, he also adopted a dairyless, vegetarian diet, augmented with nutritional and herbal supplements. He underwent a series of localized hyperthermia treatments and colonic irrigations, as well, and had his mercury amalgam fillings removed from his teeth. "I began to incorporate elements of many health programs, because I wanted to survive," he says. He has. Today, Neal continues on in good health. When asked about his experience with conventional medicine, he becomes angry. "I feel I was ripped off," he says. "I should have been told about antineoplastons in the first place. The chemotherapy may have temporarily shrunk my tumor, but it did not resolve my underlying problem. It was only after I met Dr. Burzynski that I started to make progress. I’m eternally grateful to him, because as far as I’m concerned, he saved my life." Neal’s suggestion to others diagnosed with cancer is simple. "Learn about all the alternative therapies," he says. "You should know more than you will ever use. Read, explore, and research everything, keeping an open mind. Visit the clinics. Consult with the doctors. Interview patients, especially those whose histories, type of cancer, stage, and background are most like your own, because different therapies have better track records for different types of cancer. Most importantly, don’t become passive. Your treatment is a choice. Don’t let others make it for you. Take charge and face it head on."